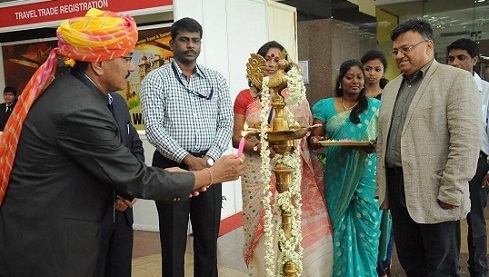 Jaipur : The Department of Tourism (DOT), Government of Rajasthan bagged the ‘Best Decorated Stall Award’ today at the India International Travel Mart (IITM) being organized at Chennai Trade Centre, Nandambakkam. The Department is participating at the 90th edition of the 3-day mart. The DOT is showcasing tourism products, Rajasthan Tourism Development Corporation (RTDC) properties as well as the luxury trains (Palace on Wheels, POW and Royal Rajasthan on Wheels, RROW). An effort is being made to appoint General Sales Agent (GSA) during the Mart. The Executive Director of RTDC, Sunil Sharma and the Joint Director, DOT, GS Gangwal are representing Rajasthan as mart and are having one-on-one meetings with the local tour operators and travel agents. Notable, the IITM is being held in Chennai from 29-31 July. It is to be noted that Rajasthan is a one of the ‘Partner states’ at the IITM.